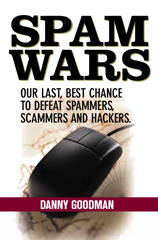 In Spam Wars I urge caution when confronted with forms that control your email preferences. In the past I have seen plenty of confusing, double-negative statements next to checkboxes that would take a logician to decipher. I thought that practice was a thing of the past, or at least relegated to really sneaky marketers. I registered at a web site that supports a British cultural magazine, to which I subscribe. The publisher behind the magazine produces a number of small-niche magazines that appeal (not to pat myself on the back) to a fairly intelligent clientele. Okay, we're downright snooty and snobby. But that's not the point. From time to time [removed] will allow carefully selected parties to contact you about their products and services. Please indicate below your preferences. The initial state of all three checkboxes is unchecked. If you read the first one and don't want to get emails, then you'll leave it unchecked. But if you assume that leaving the remaining two unchecked also keeps you off the lists, you'd be mistaken. To be kept off all lists, you have to use the correct matrix: no-tick, tick, tick (I think). That's downright disgusting. There is no need to introduce asymmetry to the selection process—except to confuse or deceive registrants. Shame on this web site form and its perpetrators. This outfit has turned a previously happy paying customer into someone suspicious of its every move. Good work, chaps!